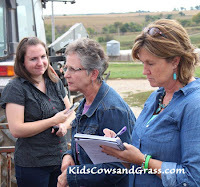 Okay, okay, yes I know I'm a rancher, so before you ask why I was on the tour with a group of bloggers, I want to remind you that I am a cattle rancher--not a vegetable farmer, or a dairy farmer or a hog farmer. I do NOT know all there is to know about agriculture and I admit, before the tour, I had never been to most of the places we visited. And, even though I haven't been the most regular of bloggers recently, I am a blogger!!! Hello! I knew one of the gals who was on the trip through a #140Smalltown conference a few years ago. I have followed her for a few years and was really excited to get to know her a bit better--and this trip didn't disappoint me! I truly learned a lot about other farmers and ranchers and it was really fun to experience this tour with a group of gals who were unfamiliar with agriculture! They asked pointed questions and I was so proud that the people we visited were not afraid to tackle some tough issues. 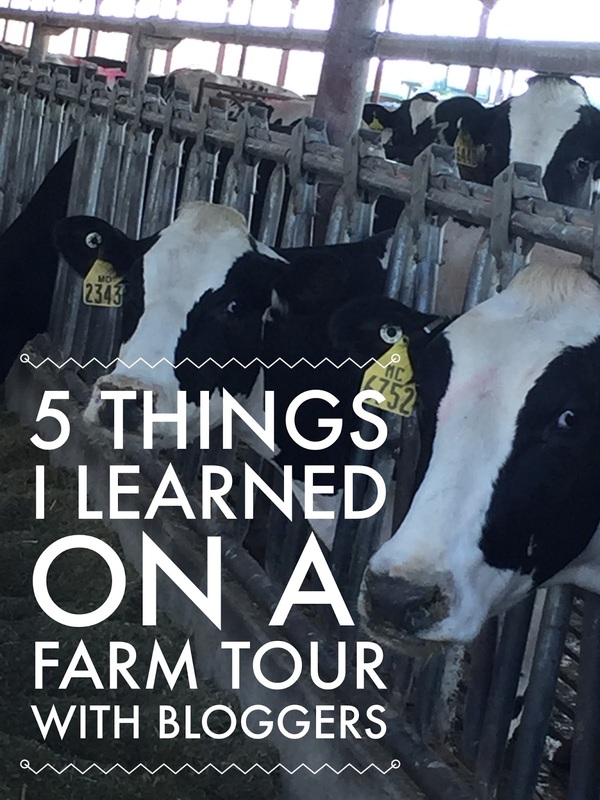 Here is my countdown to the Top 5 things I learned on the #FarmFoodTour from my own perspective. 5. Farmers are really scientists and mathematicians! The first farm we visited was a hydroponic basil farm--I LOVE basil! I was excited to just see how basil is grown for mass consumption, but I was amazed at the research and calculations necessary for the Calann Basil Farm to begin production! 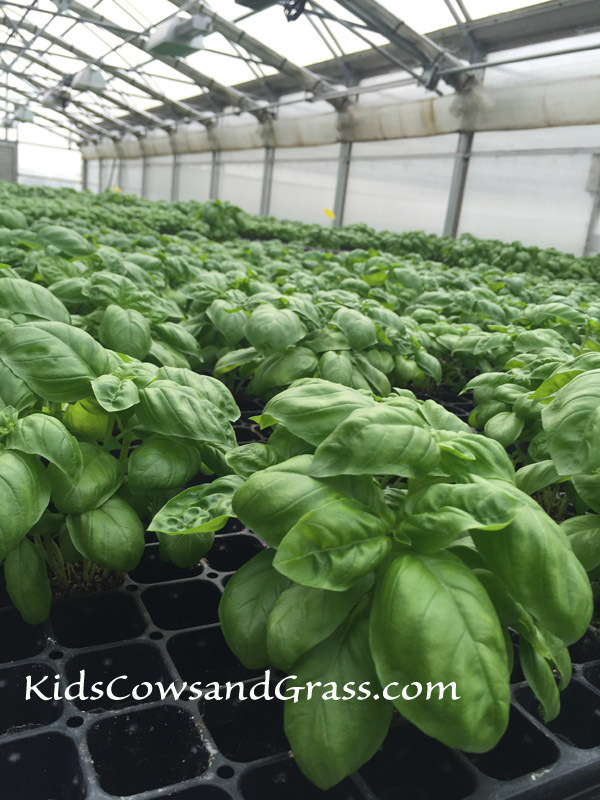 Jeff and Pam started the business from scratch and did their own research--from nutrient requirements of basil at various stages of growth, to humidity and light needs. That also made me think of the farmers nearer to me, Derek and Katie Sawyer, who we visited later that day. The Sawyers run a typical row-crop farm in central Kansas. The math and science that is involved in their operation became obvious as Derek began talking about their new tube irrigation system in their soybean field. He threw out terms like "evapotranspiration" and then proceeded to explain how that affects how much water they use on their plant and how their new irrigation system saves water every year by more effectively targeting when and where the plant needs it. "There are more scientists who believe in the safety of GMOs than believe that man caused global warming. 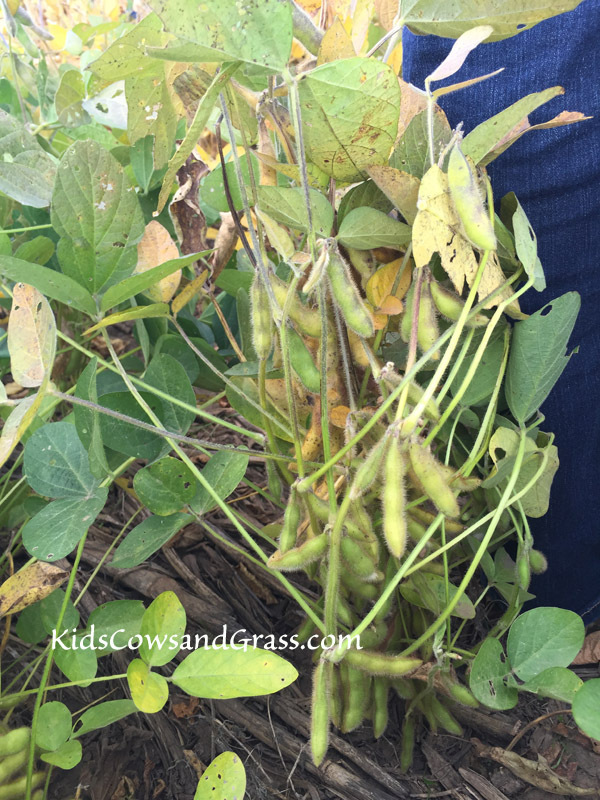 We don't shy away from feeding our kids GMO food; we rely on science," said Katie Sawyer as we stood in the middle of their soybean field (soybeans are one of only 8 GMO plants created today). Frankly, it took us about 3 minutes to get to the topic of Genetically Modified Organisms on the Sawyer Farm. The bloggers in attendance were all furiously taking notes--me included! Katie said that with their new irrigation system, they can't use mechanical means to get rid of weeds--that means they can't use a plow to dig up the soil (and probably their new tube irrigation system) and kill the weeds that way. Derek also pointed out that for soil conservation purposes, we don't want to disturb the soil repeatedly anyway! 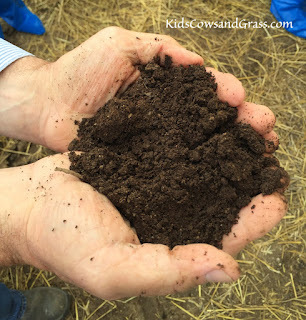 Farmers are using more "no-till" methods which means they use the organic matter of the previous crop to protect the soil surface and don't plow it up at the end of the season. New seeds are actually planted right into the stubble or residue left over from the previous crop. That saves soil, water and nutrients--allowing for a smaller carbon footprint. But weeds still grow and steal nutrient and water, as well as shade the new crop. So the Sawyers plant a GMO soybean that is resistant to a chemical that kills the weeds and everything else in the field, except the resistant soybean. This leaves a clean field early in the growing season that allows the soybeans to grow to their full potential without competition. (that is not a direct quote, but I don't write as fast as I used to with a pen!) Derek said science shows there is no danger from glyphosate residue on the beans, as glyphosate has a short half-life and it is used early in the growth of the plant. He said if we are to be able to continue to use conservation methods to protect the soil and water, GMOs are a tool we need in our toolbelt. 3. The environment is of critical importance to every farmer and rancher--sustainable before sustainable was cool! At the Good Farms, we saw heritage breeds of hogs and talked with Craig and Amy Good about how they raise pork for a niche market. They have recently been marketing heritage breeds of pork through Heritage Foods. I was amazed to see how their hogs are raised--as I had never been to a small or large hog farm! Pigs are social and curious and the bloggers and I enjoyed taking many pictures of cute pigs--big and small! But what really intrigued me was Craig's story about composting. Their baby pigs are born in a farrowing barn and are weaned and moved to a barn with all of their litter mates and pigs born about the same time. They live in an open barn with deep straw bedding to keep them clean and warm in winter. In the summer, they have fans and sprinklers to cool the pigs. But bedding them down and adding to the bedding every week creates a huge pile of straw and pig manure! Craig said when those pigs are moved to another barn or sent to the packing house, they do a thorough cleaning of the entire barn and pile the manure and wet, soiled straw into a huge pile to compost. They have to turn it as it "cooks" and ferments. Now, I don't know if you know what pig manure smells like, but it really stinks! In order to show us how mellow and good this compost becomes, Craig actually picked up a handful in his bare hands to show us. Each of us gals took a sniff and I will tell you it smelled like rich, nutritious soil! No trace of pig manure at all! In addition, we visited a large dairy farm in western Kansas. The McCarty Family Farms is run by a family and as they created their different locations, they focused on helping communities as well as sustainability. They have won many awards for environmental excellence and I was impressed with how they recycle water throughout the entire farm and processing plant. All water is reused in some way after its initial use--even if it is just used as irrigation water from the lagoon. But I was most excited about the water that is evaporated from the milk before it is shipped to Dannon for yogurt making. They capture that evaporated water, filter it and it is either used as wash water when they clean the plant or the milking barn, or it may be mixed with well water for the cows to drink. It is perfectly clean, although devoid of minerals since it was evaporated. But when you mix it with water from their well that has natural minerals, it is perfect for other uses. What a great example of SUSTAINABILITY! 2. 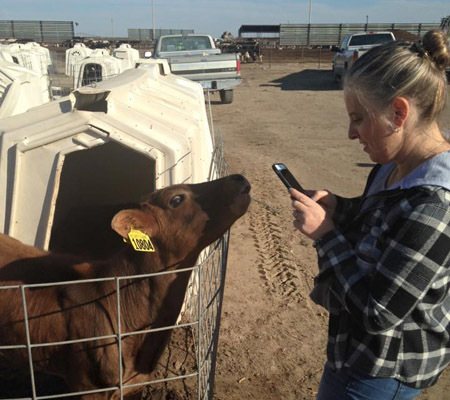 Farmers are ranchers must be marketers and be able to take advantage of niche markets. 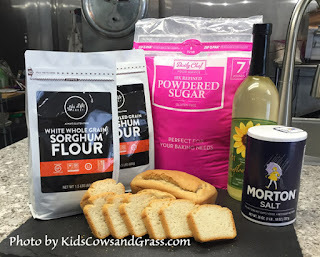 At Nu-Life Market, a grain sorghum flour processing facility we met Earl Roemer who saw an opportunity to get involved in the gluten-free product market and as a farmer, also help the local farmers benefit! I admit, I do not eat gluten-free products as none in my family have any gluten sensitivities. So I had no idea what a frustration it can be to try to find good gluten-free products. Nu-Life uses white grain sorghum and has worked with food scientists to blend it and milling scientists to mill it perfectly into a delicious gluten-free flour. I have been told by the other bloggers that gluten-free bread is the hardest thing to make well in your own kitchen. But Earl has a scientist that has created a recipe for a delicious loaf of gluten-free bread! It will be marketed soon, but already today he has numerous products available in stores from flour to pearled grain sorghum and from sunflower butter to popped grain sorghum. Look for Nu-Life products today! They also supply many major food companies with the ingredients for gluten-free foods. Earl was just a farmer who wanted to get into the food processing market and saw gluten-free as an opportunity! He is now a major player in the gluten-free product market and I am impressed to know it was a farmer who started it all! But my mind started racing when we drove away from Nu-Life. I have never been a critic of organic or naturally raised products, but I also have not been interested in producing beef in that way. But I realize it is important that we have choices--both as farmers and as consumers! 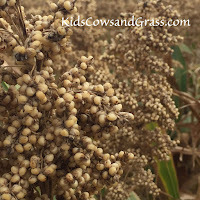 Raising a niche product can take extra time and definitely extra expense--for example, Earl said the farmers who grow white grain sorghum for his processing plant must use farm equipment that is dedicated to the crop for human consumption. So they must have a separate combine (often $500,000 cost) and grain carts (I estimate at $40,000) as well as handle the grain differently. This is a lot of hassle and those farmers need to be paid for the extra time, equipment and expense they incur! So choices must come with a price tag and that doesn't mean that those choices are better or worse for us. They are just CHOICES! So when you see the price of certain products that take more time and handling, don't criticize. Make your selection knowing that everything in the store is safe and we are blessed to have choices in America. 1. When people are able to see farms and ranches firsthand and talk to the people doing the work of raising our food, they are supportive and comfortable with the food available in our local stores. 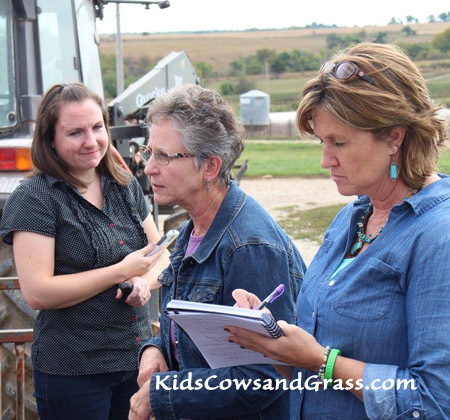 By that I mean that the gals on the tour came loaded with their own ideas of safe and nutritious food and they had questions already formulated in their heads or listed on paper that they wanted to ask of the host farms. I believe they all had the chance to ask anything they wanted and the farmers answered each individual question with respect and honesty--no one laughed at their questions or got defensive at the misunderstandings. But they told the gals how they farm and why they do certain things. Also, they gave us their contact information so we could follow up with them at any time in the future. I was honored to have met the farmers as well as the bloggers and I have new friends across Kansas and Nebraska in the blogging world! I encourage anyone to visit a farm nearby. Ask farmers why they do certain things. And I encourage farmers and ranchers to truly listen to the questions and do not get defensive--it isn't anyone's fault that not everyone knows what happens on a ranch! Let's do our part to answer the questions and concerns of those around us and hopefully we will improve communication all around! Listed below are the gals who attended the tour with me and their blogs they wrote about the tour. Please read them and share them with your friends! 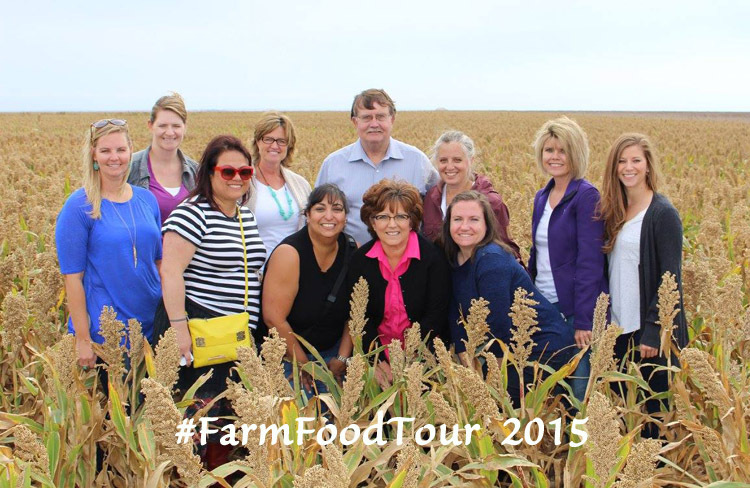 They are all intelligent and wonderful bloggers who took the time to visit farms and then share their experience. Rock on, my new friends!! Megan Leon: Are GMOs bad? GMOs, labeling, antibiotics, Oh MY! 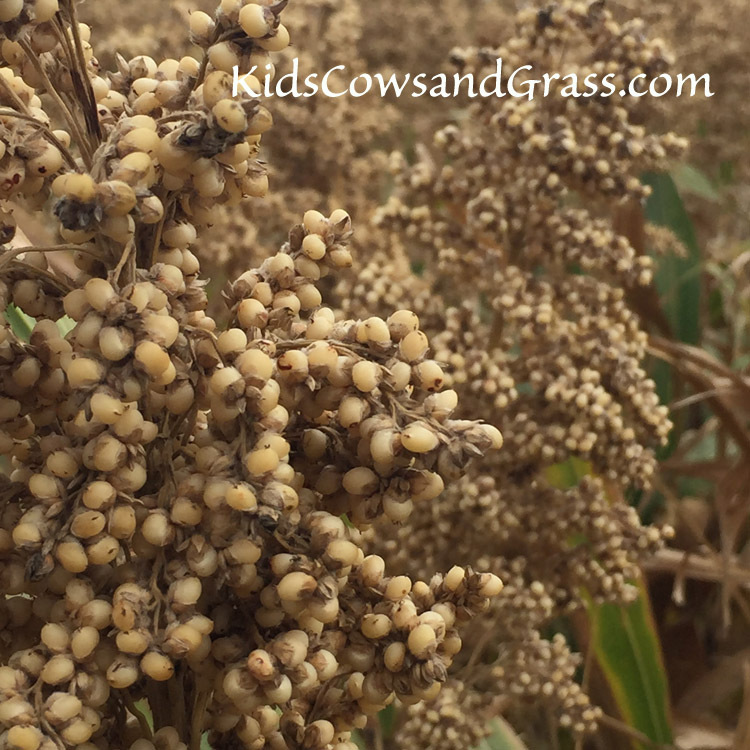 Sharmin Meadows: Family Farms Across Kansas Impacting the Nation, and the Lessons I Learned. And to close out the tour, we stopped at my pasture to see the cattle as well as my all-woman crew that had gathered the cattle and prepared a meal for the tour attendees in the pasture (along with cocktails)! We talked about sustainability as it relates to cattle ranchers in the Flinthills of Kansas and my involvement in the US Roundtable for Sustainable Beef (don't worry, I'm working on a new blog post about this soon!) as well as cattle and how we insure they are healthy. I shared my story with these gals over the 3-day tour, as well as many special moments. I have made some really great friends and I believe the ag community has some new friends, as well. Great post. I am pleased to learn about these businesses.